So what’s the number one thing you shouldn’t forget to pack when you travel? A charger for your phone. Guess what I forgot? And what that meant was I had to jump into my little car and find the Apple Store on the outskirts of Milan (which happens to be closer to the town of Gorgonzola, so it’s a wonder I didn’t just keep driving there instead) as soon as possible. But there I was at a shopping mall—quelle horreur!—on a rainy Saturday morning with residual jet lag and a flat phone on my second day in Italy. The good thing about that: Italy follows the universal rule of shopping malls which dictates that all patrons walk around like zombies, so I didn’t stand out one bit. Once I’d made my purchase and breathed a huge sigh of relief (thank you, proliferation of Apple), I was free to explore Carosello in the suburbs with the rest of the regular folks hiding out from the rain. Now before you start to feel too sorry for me, remember I’m still in Italy so even in an indoor shopping mall, things are generally better. Like the food. And the people watching. Or, dog watching as it were. 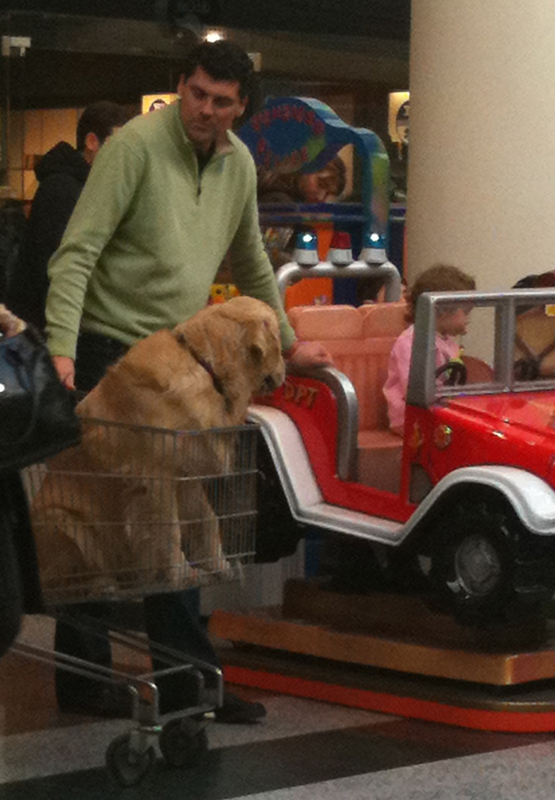 As I sat there enjoying my lunch, I happened to see this guy with his beautiful golden retriever in a shopping cart, semi-tending to his daughter in the fire department jeep thing. I can tell you that the dog received much more attention from passersby than the child, which was entertaining to watch. In any case, I sat there sipping my cappuccino taking it all in and thinking: somewhere in this giant mall there’s a lucky lady getting to shop freely while her husband is not only not rushing her but he’s also looking after the kid and the dog.